I am doing a training programme for tennis. It will be 8 weeks long, training 3-5 times a week. One of my goals will be to improve endurance; this is so I can last a whole tennis match without becoming too tired. 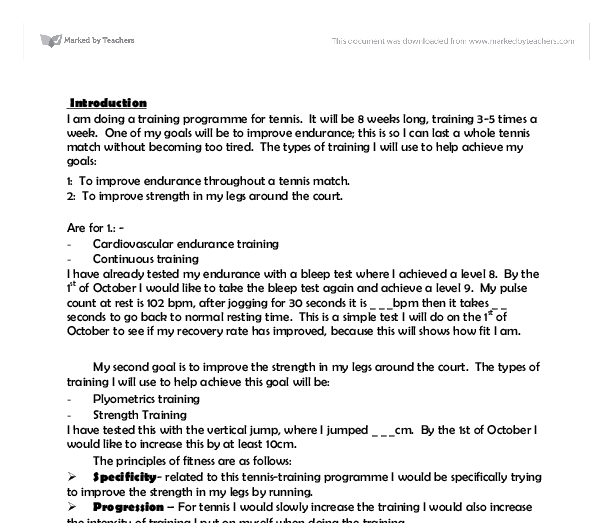 Introduction I am doing a training programme for tennis. It will be 8 weeks long, training 3-5 times a week. One of my goals will be to improve endurance; this is so I can last a whole tennis match without becoming too tired. The types of training I will use to help achieve my goals: 1: To improve endurance throughout a tennis match. 2: To improve strength in my legs around the court. Are for 1.: - - Cardiovascular endurance training - Continuous training I have already tested my endurance with a bleep test where I achieved a level 8. By the 1st of October I would like to take the bleep test again and achieve a level 9. My pulse count at rest is 102 bpm, after jogging for 30 seconds it is _ _ _bpm then it takes _ _ seconds to go back to normal resting time. This is a simple test I will do on the 1st of October to see if my recovery rate has improved, because this will shows how fit I am. My second goal is to improve the strength in my legs around the court. The types of training I will use to help achieve this goal will be: - Plyometrics training - Strength Training I have tested this with the vertical jump, where I jumped _ _ _cm. By the 1st of October I would like to increase this by at least 10cm. The principles of fitness are as follows: > Specificity- related to this tennis-training programme I would be specifically trying to improve the strength in my legs by running. > Progression - For tennis I would slowly increase the training I would also increase the intensity of training I put on myself when doing the training. 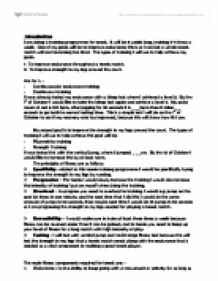 > Overload - to progress you need to overload in training, I would e.g. jump on the spot 20 times in one minute, and the next time that I did this I would do the same ...read more. For example isokinetic training would probably help the progression of the strength in my legs but the equipment needed isn't accessible to me. Principles of Training Defined for my goals for tennis: Specifity - as I want to improve the strength in my legs I wouldn't lift weights with my arms because although this would improve strength in my arms and wouldn't harm my play of tennis it wouldn't be fulfilling my goal and helping my weakness which is strength endurance in my legs. As I am also trying to improve my stamina for a tennis match I wouldn't use the same training programme for someone who was trying to improve their flexibility, although improving flexibility would help tennis match this wouldn't be specifically helping my weak point which is stamina in a tennis match. Progression - In a tennis training programme to improve endurance for a tennis match. The progression for my training programme will be more obvious in the beginning. The progression of my endurance will probably make me feel healthier in myself, and after a few training sessions, I probably could feel as though I could train for longer or at a higher intensity (see overload). When I first start training to make the muscles in my legs stronger. At first it will probably make my legs ache as usually I don't train hard specifically on my legs, so the time, intensity and frequency of training should be low so mentally and physically I am able to do training (see overload). When my legs become used to the training as in my cardiovascular training I can start to progress in my training by overloading (below). Progressive Overloading - To improve my cardiovascular endurance and muscular stamina I will have to overload. This means pushing myself harder than easy training. A few extra jumps, or an extra few metres when you are swimming or jogging each training session can make a huge difference over a few weeks, because this is overloading making you fitter in specific parts of your body. ...read more. as comfortable, again pointing your toes up as your foot reaches its final point of movement * 10 to 12 repetitions on each leg Hip Stretch * Rotate hips in a circular motion - 1min. * Upper Back Stretch - crossover legs bend down keeping legs bent and touch your toes. - for 30 seconds * Shoulder and Tricep Stretch - bend arm around the front of your face and pull elbow towards face with other arm. For 30 seconds on each arm. * Hamstring Stretch put legs next to each other with the heel next to the toe of the opposite legs which is bent , lean on the bent leg - 30 seconds on each leg. * Calf Stretch - stand with legs shoulder width apart, stand with feet flat on the floor and lift your body up and down onto the balls of your feet. * Quadriceps Stretch - put legs parallel but one slightly in front of the other, lean forward on the front legs keeping your back straight - Hold for 30 seconds on each leg. Cool Down The reason I will have to do this after training is because if I stop suddenly after training is because my heart will still be beating at a fast rate and if I stop suddenly then the muscles are unable to pump blood back at the previous rate, this can cause the blood to pool in the veins and this makes the lactic acid remain in the blood stream, and this can cause stiffness and soreness. After all training I will walk for 3 mins at a slow pace until I feel my heart rate slowing down dramatically. I will do a few gentle stretches to ensure my muscles wont be stiff after training. I will do some of the above stretches, I will especially do the stretches acting upon the leg muscles when cooling down. Otherwise I will just jog then slowly walk for three minutes to reduce heart rate. ...read more. Do this on each leg four times. * To stretch the hamstrings stand with one foot in front of the other and gently lean forward on your front leg. Doing this you should feel a stretch down the back of the leg. then do 5 sets of 50m sprints with the bag/sled/parachute on your back. Wednesday Training for local club, don't be lazy! Thursday Plyometrics again, skip with your arms and legs as far apart as possible about 30m as fast as you can, do this three times. Both clockwise and anti-clockwise. Next, stand with one foot in front of the other. Have both feet facing forward, bend the back leg and keep the front one straight. Put your hands above the bent knee and pull up toes of your straight leg up towards you knee. the ball; The reason behind me choosing this one on one coaching, is because the coach will have the quality to change the shot up each time, therefore challenging me to keep making different judgements of the bounce of the ball, therefore making me improve a lot more within this area. I will not have to redo the 50m Sprint again as I am not training speed, the Illinois Run as I am not training Agility and the Multi stage fitness test (Beep test) as I am not training Stamina as my main components. The specificity of this test however is below average for the activity I have done. 30m Sprint Test - Speed Equipment: 30m tape measure, stopwatch. Target Population: Sprinters, jumpers, games players or anyone who is injury free. Advantages: Poor reactions and starting technique let down result. the goal one for a shot down the middle of the net 2 point for towards the nearest side 3 for far side and 5 for hitting the inside of the post. To improve shooting accuracy and power while the ball is moving and still.